25. ZeroRanger (PC) 2.67 . . . . . . . . . . . . . . .
= denotes the game holds the same position now as the year indicated. + denotes the game holds an improved standing compared to the year indicated. - denotes the game holds a reduced standing compared to the year indicated. * denotes the game was not on the list for the year indicated.
. denotes the game was not released or otherwise eligible for voting for the year indicated. ~ denotes the game vote was classified (significantly) differently for the year indicated. = denotes the game was also on the HM list for the year indicated. + denotes the game was on neither the HM list nor the top 25 for the year indicated. - denotes the game was in the top 25 for the year indicated. The lead rotates again as Ketsui claims its first ever first place. Meanwhile, blitzing out of essentially nothing comes the sudden finisher now known as ZeroRanger, described by waves of new fans as being "as irresistible as unripe citrus". It's been a long time coming, but Mars Matrix's chain timer has finally run out. Only DoDonPachi and Ikaruga now remain as perennial no-missers, both of which continue to look like they won't be flirting with the lower end of the list anytime soon. More and more as time goes on, the benefits of sticking around and weathering the genre hype phases are showing themselves. The Honourable Mentions are always open for a steady re-entry, but a fortunate enough game might even find themselves in the position R-Type Delta has this year - that being a position right back up at the pointy end. After what a brief count appears to be a record period of time off of over a decade (beating out the previous period held by Under Defeat), and almost getting enough votes the last couple of years, the game has now not only returned but vaulted to its highest placing ever. The discussion thread for this year's poll is here. The votes for this year's poll can be found here. The full results are just down the page there but if you want a shortcut you can click here. Last edited by Nifty on Thu Mar 21, 2019 3:32 am, edited 1 time in total. 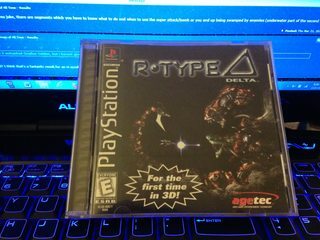 R-Type Delta! Yes! I'm so happy to see this in 14th position. Game is awesome and the soundtrack is killer. Next year I'm definitely going to vote. No Mars Matrix in the top 25? Wow, zero ranger made it to the top 25, congrats guys! AW YISS Radirgy on honorable mention, finally!!!! I'm sad about Mars Matrix dropping off the top 25, but Under Defeat being on there makes me happy. That honorable mention list is solid. You can't go wrong with any of those. It's kind of amazing to be able to list over 50 great games in a genre, and there are plenty of excellent ones still not mentioned. What a great reminder of the huge quantity of high quality shooters out there. 2019, the year of Ketsui. Thunder Dragon 2 crawling up the list hell yeah. Mushi Futari was robbed. There's there's about the stage design in that game that is really special. Seeing R-Type in the top 10 brings me life. Arguably the best game of the 80's, shmup or otherwise. Love to see Delta in the top 25 as well. APB and Crimzon Clover ranking really high is also ace. Ketsui, I really liked what I played, the final stage is just a bit out of my skill level these days, and married life means it's hard to dedicate time to a game I can't play on the couch. I try to reserve judgment until I can 1CC, but I see the quality for sure. Congratulations to Ebbo and eebrozgi for ZeroRanger's very warm reception! Interesting that there were only two "Games Supported by at least half of voters (≥29.0 combined)," which games were they? Indeed yes, congratulations to the Zero Ranger developers. Still looking forward to the Linux version whenever you guys get around to it! As for the list, it's very interesting. R-Type and R-Type Delta are my two favourite shmups -- both in my top 10 games regardless of genre -- and I'm ecstatic to see them so well placed this year. Thanks for doing the leg work again Nifty! Solid lists for the most part. Deathsmiles over Progear is a bit of a head scratcher, but that is a matter of taste on my part. And Mars Matrix got demoted too!? Also I need to play Thunder Dragon 2. Congrats to System Erasure for debuting at #25 with Zero Ranger. I see that staying on either one of these lists for a long time to come. How come this thread isn't at the top of the forum every year? It's a great resource for new players who are wondering what they should play. "Adopt the pace of nature: her secret is patience." So, Ketsui, huh? I can't say I expected this, but I'm perfectly fine with it. Very solid lists again. Congratulations to ZeroRanger. Thank you, all! It's surreal seeing ZeroRanger and System Erasure up there. There might be a bit of honeymoon effect going on, but we'll enjoy it while it lasts! This year's full results are now also in order. Last edited by Nifty on Thu Mar 21, 2019 3:28 am, edited 1 time in total. Radirgy getting in the HM is cool and pretty much unexpected. So is TD2 staying in the Top. I do hope it's because people start to realize they are cool games rather than because voter count was low or something. Also, congrats to eebrozgi and Ebbo for ZeroRanger! It's well deserved. While I wouldn't be surprised if its rank in the next years ends up being a bit lower as the initial enjoyment and novelty stabilizes, it's a very solid game and I don't doubt it'll still be on many people's lists. And thanks Nifty for the full list! I think I have downloaded so much I am bored with downloading. No really I bored with downloading stuff I might consider moving to Canada or the pacific. Curious to know what the rationale for combining Gradius II (Arc/NES) in the same vote but not doing it for Gradius III (Arcade/SNES)? Both ports are quite a bit different from the original. Did anyone actually vote for Gradius II NES? Other than that I'm really happy to see Ketsui finally get a first place finish after so long. Favorite thing about the list: R-Type in top ten! Thanks, Nifty! Really interesting results. I voted for Gradius II NES (and also for Gradius NES). In both cases, I'm fine with lumping them in with other versions though. But then, I'd also be fine with lumping Gradius III ARC with SNES, Salamander ARC with NES, and Thunder Force III with AC. 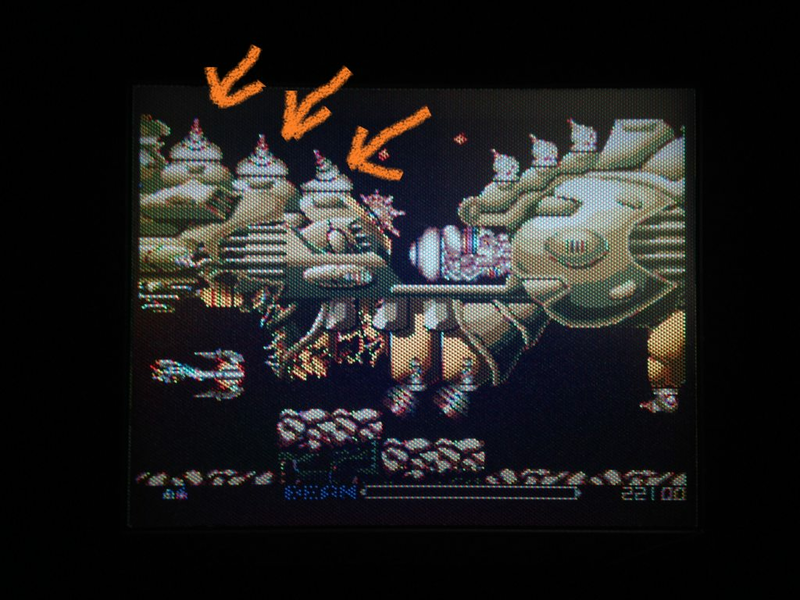 why is R-type delta so high? Yeah, that's the last Cave game I'd want to see fall off the list. At least it's among the honorable mentions. Placing 16th is super underrated? I think that's a fantastic result for an H-scroller of that vintage. Because it's excellent! And I definitely wouldn't describe it as an easy game (though I typically use the R-9, not the R-13). Oh, I don't know. Ibara's in that weird place where I'm constantly reminded of Bakraid and Garegga while playing it, but I think both of those are much superior. Actually, Bakraid's low placing (62nd) surprises me: I've always thought it plays very well -- better than Garegga -- though the A&V is admittedly not as distinctive. Anyway, I like Bakraid. Even with the R13, R-Type Delta it's still no joke, there are segments which you have to know what to do and when to use the super attack/bomb or you end up being swamped by enemies (underwater part of the second stage comes to mind). yeah with the R-9 it's harder. r-type's usually relies on alot of memorization. but delta is a bit light on memory. i think it's one of the easier ones in the series to master. i think i beat alot of the stages the first time through. glad r-type 1 is up there... really love it to death. i always take out the near impossibly accessible rail guns on top of the stage three battleship. that's always a fun challenge. I was surprised to see Crimzon Clover so high. Don't get me wrong, it's an awesome game, and as I've been focusing on it for the month of March, I'm finding that I like it a lot. I guess it's just that it's a new enough game to where I wouldn't expect to see it on the list in the top 5. Whoa! Is that off a Turbo Express? Yeah! 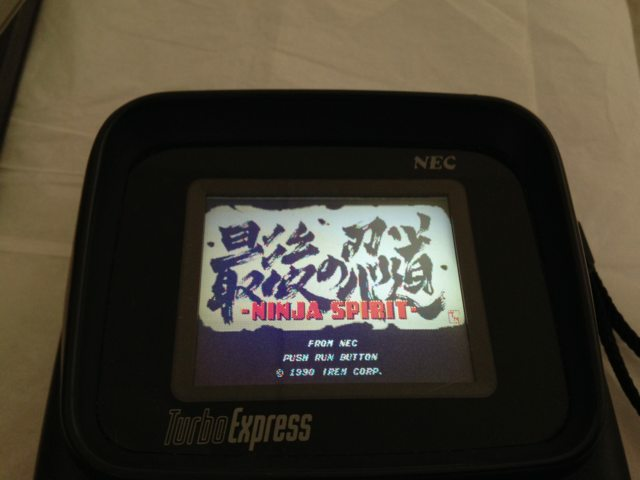 i love the original OEM screen. i know plp get these modded with different screens but i love the look of it unchanged. i got if from a retro store last year that recapped it.